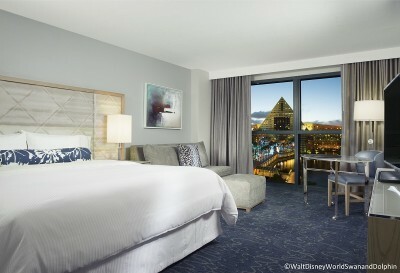 The Walt Disney World Swan and Dolphin Hotel is in the midst of its biggest makeover ever and the room refurbishment has been completed at the Swan. The $125 million project is set to transform every room at the Swan and Dolphin. The room refurbishment is inspired by the resort’s water-themed architecture. Rooms will feature upgraded furniture, HD televisions, additional power outlets, a glass-top desk, and more. Each room will also feature the famous Westin Heavenly Bed. The décor features a combination or blues, whites, and grays. Interior design and architecture firm Garcia Stromberg/GS4 Studios worked with interior design firm KBCO Design to create the room concepts. The refurbishment of the Dolphin’s 1,509 rooms starts later this year. The entire project is expected to be completed in 2017.